Older dogs with slowing hearts are getting a new ‘leash’ on life at Auburn University College of Veterinary Medicine, where advanced technology and new treatment protocols have created an emerging cardiology program. 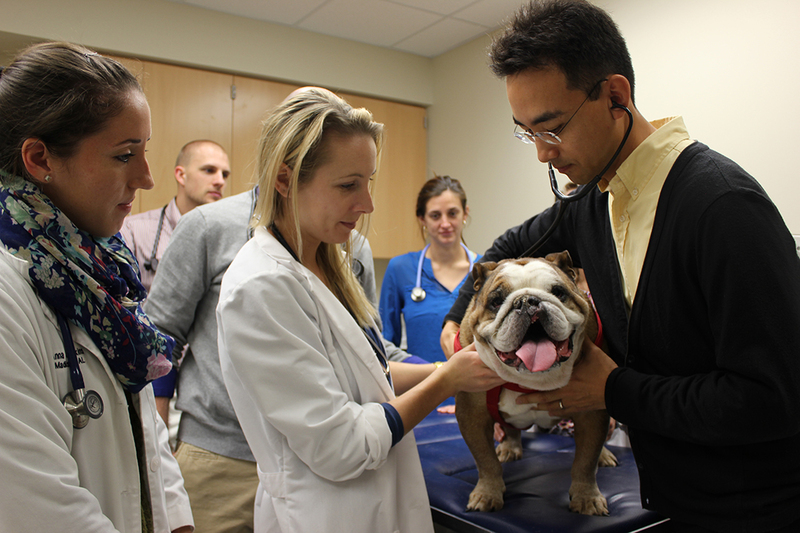 Dr. SeungWoo Jung listens to Joe’s heart with the assistance of fourth-year veterinary students Anna Jenkins and Jessica Russell. Dr. SeungWoo Jung, assistant professor and clinician in the Cardiology Services of the Wilford and Kate Bailey Small Animal Teaching Hospital, recently placed one of the most advanced pacemaker systems used in humans in Joe, a seven-year-old bulldog, owned by Wayne and MaryAnn Swift of Meridian, Miss. Because of the technology and faculty expertise, procedures once considered complicated are now becoming routine. During Joe’s recent checkup, tests shows the pacemaker was keeping his heart beating normal. “He’s really doing quite well and from this point on, Joe will only need to be seen on a yearly basis,” Jung said. For the Swifts, Joe is a loyal family member, and they had no hesitation to bring him from Mississippi for treatment. 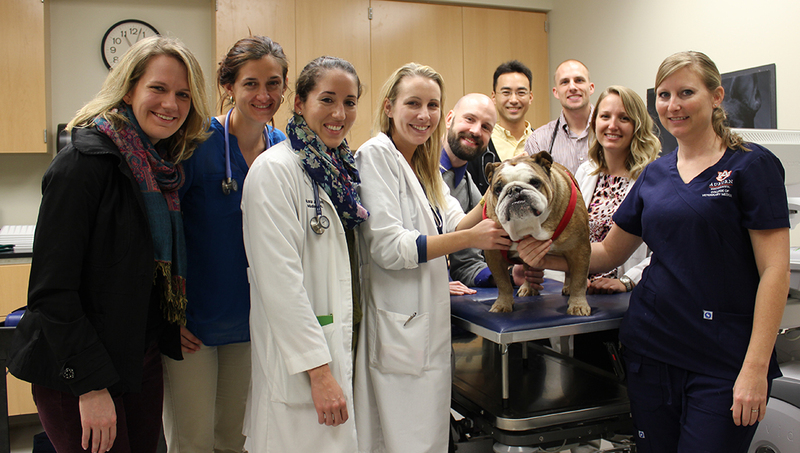 Students, residents and faculty gather around Joe, from left: Dr. Annabel Botsford, an internal medicine resident; fourth-year veterinary students Cristina Fugedy, Anna Jenkins, Jessica Russell and Rob Schnurr; Dr. SeungWoo Jung; cardiac intern Dr. Daniel Newhard, fourth-year veterinary student Annie Gintert, and licensed veterinary technician Keri Harrelson. Joe began experiencing fainting episodes and collapsing last this past September, and after visits to a Mississippi veterinarian, they determined the next stop was Auburn’s College of Veterinary Medicine. Pacemakers help monitor and control the heartbeat. A pacemaker will send electrical impulse to the heart to keep the beating rhythm in sync and pumping correctly. 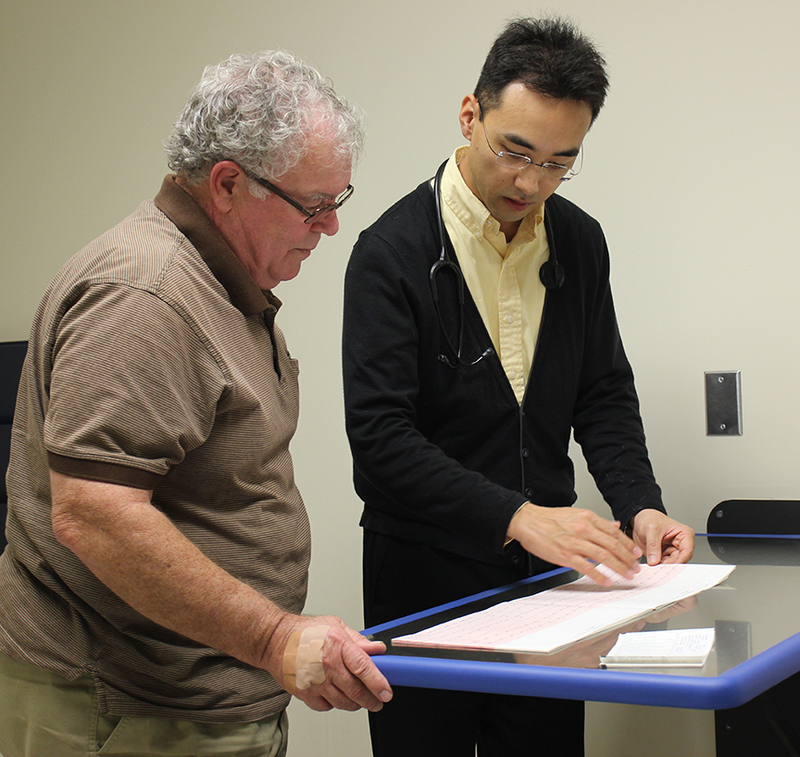 Dr. SeungWoo Jung goes over Joe’s test results with Joe’s owner Wayne Swift. The procedure is similar to the one done in humans. Under anesthesia, a pacemaker wire is threaded through a dog’s vessel in the neck to the correct place in the heart. A small incision, made in the back of the shoulder, then allows for insertion of the pacemaker under the skin and connection to the wire. In the past, Jung said, pacemakers for dogs were older human models, which only regulated the beating of the heart’s bottom chamber. Today’s human pacemaker regulates the heart’s top and bottom chambers, but because of technical challenger, was not typically used in canine patients.